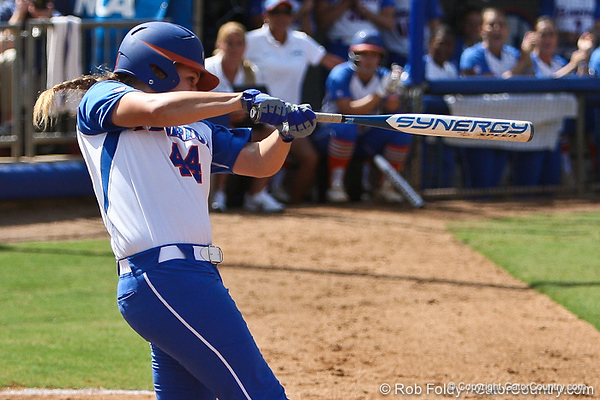 The third-ranked University of Florida softball team used a pair of two-run homers by sophomore Brittany Schutte to help propel the squad over Oregon, 9-1, in the first game of NCAA Softball Super Regional play at Katie Seashole Pressly Stadium on Friday. Schutte sent back long balls in the first and third innings, scoring senior Kelsey Bruder both times. The right fielder also scored the ninth and final run to enforce the run rule in the fifth off a single by senior Tiffany DeFelice. A crowd of 1,089 Gator fans stuck through two rain delays to support the Gators in their quest for a fourth straight Women’s College World Series appearance.